We got a subscription box from Try the World featuring Japan right around the time I picked out the Okonomiyaki pandake recipe out from our Food & Wine cookbook. So it felt like a sign that we should try it! It had nearly everything we needed. 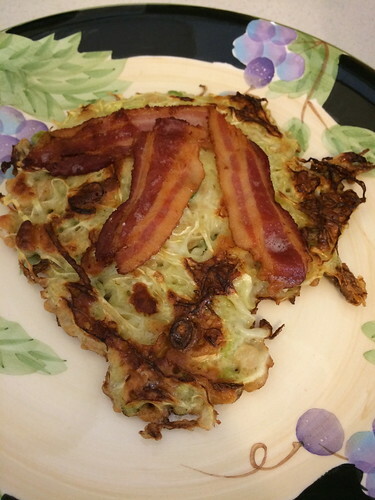 These cabbage pancakes can be made a lot of different ways. The recipe in the kit was slightly different from the Try The World recipe was slightly different from the Food & Wine recipe. This is how we usually make them. 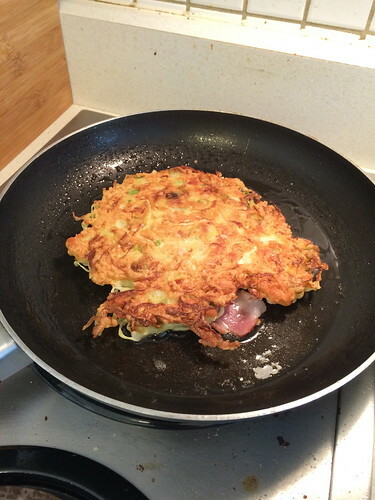 Mix together 1/3 cup water, 1 egg, and 1/2 cup okonomiyaki flour. Stir in 2 cups shredded cabbage, optional 1 tablespoon diced up pickled ginger (like the type used for sushi), 1 tablespoon or so chopped green onion, and 1/4 up of the tenkasu. You can substitute panko bread crumbs. Oil a pan. We usually make two big pancakes out of this. And usually cook them one at a time. If you want to make 2, just put half the mixture in and flatten it. Add two strips of raw bacon on top. Cook over medium-low heat for about 8 minutes. When the bottom is crispy, flip it over, bacon side down. Cook about 8 minutes. 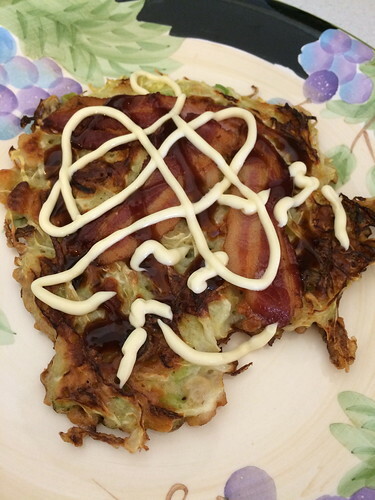 Top with the tonkatsu sauce and kewpie mayo! 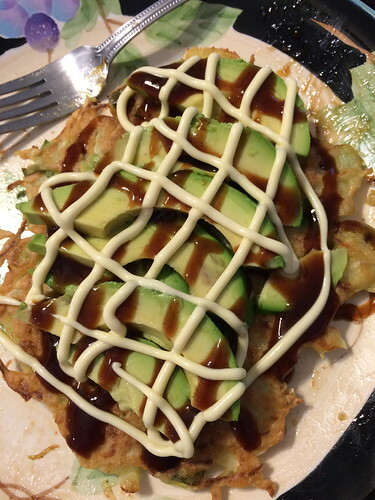 Once when we didn’t have bacon, we did avocado and that was amazing too!